If you’re looking to experience the arts and culture of Connecticut, the Stamford Center for the Arts is the place to be! This non-profit arts organization caters to all of your entertainment needs with a wide array of exciting events. Stamford Center for the Arts is comprised of two newly-restored properties in Downtown Stamford, the Palace Theatre and Rich Forum. Both of these theaters are located within four blocks of each other and just 15 minutes from the Stanton House Inn, making it easier than ever to enjoy some of the region’s best entertainment during your stay! Read on to learn more about the Stamford Center for the Arts and upcoming shows you have to look forward to! Interested in more local entertainment like the Stamford Center for the Arts? Download your free copy of our Greenwich Vacation Guide for a full list of great recommendations and other things to do during your getaway! This entertainment venue is the center’s most popular, and for good reason! It was voted “Connecticut’s Most Magnificent Theater” and boasts a Thomas Lamb design that accommodates up to 1,580 guests! From the moment you approach, you’ll be greeted with a stunning square-shopped awning that proudly states “Palace” in bright red letters. The theater also showcases a modern facade with all-glass windows and luxurious space. Many well-known companies and troupes throughout Connecticut call the Palace Theatre home including the Stamford Symphony, the Namaskaar Foundation, the Connecticut Ballet, and the Stamford Young Artists Philharmonic. Each year, you can expect outstanding performances from each of these organizations. This cozy 757-seat theater serves as an extension to for the Stamford Center for the Arts. Its main purpose is to host smaller-scale productions such as talk shows. However, don’t let this deter you! Popular television productions such as Jerry Springer, Maury, and the Trisha Goddard Show have been filmed here! It is a studio space for NBC Universal, meaning there are plenty of exciting shows to watch! The Palace Theatre in Stamford is on a mission to enrich the community through quality and creativity in all of their productions. So whether you are enjoying a date night, going out with a group of friends, or visiting solo, all are welcome to come together and enjoy a lively night out. Here are just some upcoming shows that we’re sure you’ll love! This ballet program is celebrating its 35th anniversary! Thirty Something! Features revivals of three dynamic one-act ballets including Les Sylphides and Strays. One of these performances also comes from the creator of classics like Chicago, Pippin, and Sweet Charity! Since 1985, the Newsboys have taken Christian music by storm! With six gold albums, 33 #1 singles, and multiple Grammy and American music award nominations, the iconic band is an undisputed industry leader. The band is eager to try something brand new during their 2017 spring tour, so get ready for a performance you won’t soon forget! Prepare to be amazed! “The Amazing Max” is known for his extraordinary skills and a magician and his ability to entertain audiences both young and old. Combining magic and comedy, Max will send you on a hilarious journey that is sure to leave you spellbound! Interested in seeing a show? Check out the Palace Theatre in Stamford seating chart to find the best seats in the house! Don’t forget to check the Events and Tickets page periodically for more upcoming shows! Searching for the perfect place near the Stamford Center for the Arts? 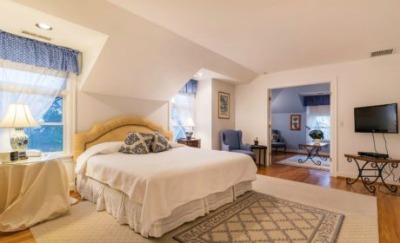 The Stanton House Inn in Downtown Greenwich is just what you need! Located approximately 7 miles from the artistic spaces, our luxury bed & breakfast will help you unwind after a long evening. Unlike typical hotels, the historic Stanton House Inn provides its guests with a one-of-a-kind lodging experience in an elegant and sophisticated atmosphere.